Presenting Poliwrath! Pokemon One a Day! Happy New Years! 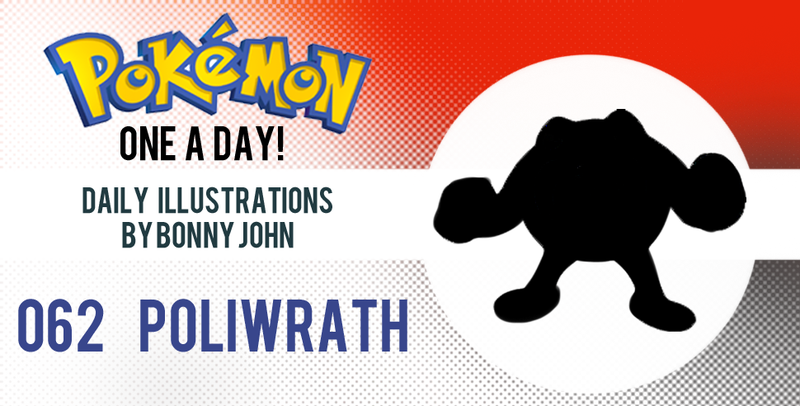 To start things off, Poliwrath leads the way. Poliwrath, the "tadpole" Pokemon, is a - wait, what!? TADPOLE? COME ON Gamefreak! Really? Don't get me started on Politoed neither. So, as as a kid and the primary demographic Pokemon was targeted to, this art series has taught you that I do not posess the "genwunner" mentality in believing that the first 151 Pokemon are all the best designs anyone's ever seen from the series. Poliwrath, you are up there with all these other dudes I hate. Argue for the case that Poliwrath is unique to his own right, and I ain't even gon' fightchu bout it. There's no point - We all know that Poliwrath is Poliwhirl after steroids. He's bigger, got darker since he be flexin' at da beach, and he's got angrier eyes. Whoopdy do! And he's still a tadpole? Really? 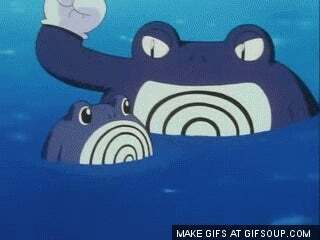 Missed potential stamped on the dude's forehead...And that's when Politoed came into the mix to make amends. I used Politoed as a backdrop in help me aim for continuing the evolution of a frog from the last two in this series. I tried incorporating green to show that the paths that Poliwhirl could take would be more aesthetically relatable. Poliwrath is an evolution that's entirely pointless - as far as Pokemon and the actual design goes. The thing is, I was ready to make this piece all about redesigning Poliwrath and showing it could be done. And it can! Look at my work in progress shots and you can see I had a very solid direction going...Until I decided to scale it back to the original. Why would I do this, especially since I've taken stabs at redesigning Pokemon in subtle and not so subtle ways? What I've been thinking about, especially with the dawn of the New Year, is that I should start focusing on presenting the character in interesting visual forms outside of just creating the form itself. Does that even make sense? Looking back at this series - I am DAMN proud of what I've been able to do, and on a daily basis for that matter. The urgency forces me to make decisions quickly, and to think smart about how I'm going to tackle the direction for the day's work so I don't run out of time prematurely. But when I looked at where I was headed, there were nods to Poliwrath but it didn't feel like him. What I want to start doing is celebrating Nintendo's designs, the good and bad - I'm proud of my result of turning this guy into a warrior frog, it further relates this family of amphibians to others like Toxicroak, Greninja, and Seismitoad. I'm going to start looking for ways to interpret Nintendo's characters as is, with my spin. Some may be more redesigned than others, but one of my goals is to keep what they have and let the execution of style make it my own, outside of having to redesign it. It'll be a tough balance but I think I can do it - I do have fun redesigning Pokemon to what I believe are stronger renditions of them than the original, but I don't want that to be the basis of the art project. I want to get back into the roots and take what they gave me and let me interpret it for the sake of exploring artistic expressions that I'm discovering along the way. So yeah! Sorry for the extra long post but with the New Year on us and all my goals on the horizon, I wanted to make even the goals of this side project something that is on the level of my main dreams, so I can develop myself into the best artist I can be. Thanks for reading and thanks for viewing my artwork! See you tomorrow!